Now available in High Definition! Radiopaque Solutions, Inc. has been developing technologies for the medical device industry for the past 25 years. These bands are produced to exacting standards and are in use around the world for medical device applications. 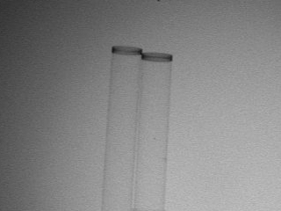 Radiopaque Urethane Tungsten marker bands heat formed into the wall of a urethane catheter. Urethane radiopaque bands can be heat formed and bonded into the wall of a polymer catheter. Bands are made from urethane and tungsten. They can be made from .015" to 1" in diameter. Wall thicknesses as thin as .002" are possible based on the application. The bands in this image are .078" diameter. RSI manufactures large diameter marker bands. Bands up to .500" or larger may be precision cut. 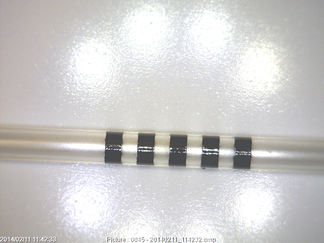 This image compares the radiopacity of our flexible markers to rigid nitinol. The band on the left is our High Definition urethane-tungsten marker. The band on the right is made of nitinol. 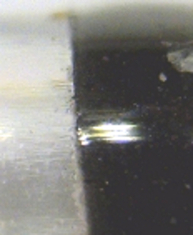 This is a micrograph of the band - catheter tube interface after heat forming. The forming can be accomplished by placing heat shrink tubing over the band, heating to 125 degrees Celsius, and then removing the heat shrink tube after cooling. Alternatively they may also be RF or heat formed using glass tooling.